For the former North American fur-trading district, see New Caledonia (Canada). New Caledonia (/ˌkælɪˈdoʊniə/; French: Nouvelle-Calédonie)[nb 1] is a special collectivity of France in the southwest Pacific Ocean, located to the south of Vanuatu, about 1,210 km (750 mi) east of Australia and 20,000 km (12,000 mi) from Metropolitan France. 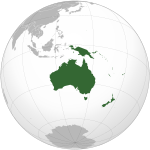 The archipelago, part of the Melanesia subregion, includes the main island of Grande Terre, the Loyalty Islands, the Chesterfield Islands, the Belep archipelago, the Isle of Pines, and a few remote islets. The Chesterfield Islands are in the Coral Sea. Locals refer to Grande Terre as Le Caillou ("the pebble"). New Caledonia has a land area of 18,576 km2 (7,172 sq mi). Its population of 268,767 (August 2014 census) consists of a mix of Kanak people (the original inhabitants of New Caledonia), people of European descent (Caldoches and Metropolitan French), Polynesian people (mostly Wallisians), and Southeast Asian people, as well as a few people of Pied-Noir and North African descent. The capital of the territory is Nouméa. British explorer Captain James Cook was the first European to sight New Caledonia, on 4 September 1774, during his second voyage. He named it "New Caledonia", as the northeast of the island reminded him of Scotland. The west coast of Grande Terre was approached by the Comte de Lapérouse in 1788, shortly before his disappearance, and the Loyalty Islands were first visited between 1793 and 1796 when Mare, Lifou, Tiga, and Ouvea were mapped by William Raven. The English whaler encountered the island named then Britania, and today known as Maré (Loyalty Is. ), in November 1793. From 1796 until 1840, only a few sporadic contacts with the archipelago were recorded. About fifty American whalers (identified by Robert Langsom from their log books) have been recorded in the region (Grande Terre, Loyalty Is., Walpole and Hunter) between 1793 and 1887. Contacts became more frequent after 1840, because of the interest in sandalwood. As trade in sandalwood declined, it was replaced by a new business enterprise, "blackbirding", a euphemism for taking Melanesian or Western Pacific Islanders from New Caledonia, the Loyalty Islands, New Hebrides, New Guinea, and the Solomon Islands into indentured or forced labour in the sugar cane plantations in Fiji and Queensland by various methods of trickery and deception. Blackbirding was practiced by both French and British-Australian traders, but in New Caledonia's case, the trade in the early decades of the twentieth century involved relocating children from the Loyalty Islands to the Grand Terre for labour in plantation agriculture. New Caledonia's primary experience with blackbirding revolved around a trade from the New Hebrides (now Vanuatu) to the Grand Terre for labour in plantation agriculture, mines, as well as guards over convicts and in some public works. The historian Dorothy Shineberg's milestone study, The People Trade, discusses this 'migration'. In the early years of the trade, coercion was used to lure Melanesian islanders onto ships. In later years indenture systems were developed; however, when it came to the French slave trade, which took place between its Melanesian colonies of the New Hebrides and New Caledonia, very few regulations were implemented. This represented a departure from the British experience, since increased regulations were developed to mitigate the abuses of blackbirding and 'recruitment' strategies on the coastlines. The first missionaries from the London Missionary Society and the Marist Brothers arrived in the 1840s. In 1849, the crew of the American ship Cutter was killed and eaten by the Pouma clan. Cannibalism was widespread throughout New Caledonia. On 24 September 1853, under orders from Emperor Napoleon III, Admiral Febvrier Despointes took formal possession of New Caledonia. Captain Louis-Marie-François Tardy de Montravel founded Port-de-France (Nouméa) on 25 June 1854. A few dozen free settlers settled on the west coast in the following years. New Caledonia became a penal colony in 1864, and from the 1860s until the end of the transportations in 1897, France sent about 22,000 criminals and political prisoners to New Caledonia. The Bulletin de la Société générale des prisons for 1888 indicates that 10,428 convicts, including 2,329 freed ones, were on the island as of 1 May 1888, by far the largest number of convicts detained in French overseas penitentiaries. The convicts included many Communards, arrested after the failed Paris Commune of 1871, including Henri de Rochefort and Louise Michel. Between 1873 and 1876, 4,200 political prisoners were "relegated" to New Caledonia. Only 40 of them settled in the colony; the rest returned to France after being granted amnesty in 1879 and 1880. In 1864 nickel was discovered[by whom?] on the banks of the Diahot River; with the establishment of the Société Le Nickel in 1876, mining began in earnest. To work the mines the French imported labourers from neighbouring islands and from the New Hebrides, and later from Japan, the Dutch East Indies, and French Indochina. The French government also attempted to encourage European immigration, without much success. The indigenous population or Kanak people were excluded[by whom?] from the French economy and from mining work, and ultimately confined to reservations. This sparked a violent reaction in 1878, when High Chief Atal of La Foa managed to unite many of the central tribes and launched a guerrilla war that killed 200 Frenchmen and 1,000 Kanaks. A second guerrilla war took place in 1917, with Catholic missionaries like Maurice Leenhardt functioning as witnesses to the events of this war. Leenhardt would pen a number of ethnographic works on the Kanak of New Caledonia. Noel of Tiamou led the 1917 rebellion, which resulted in a number of orphaned children, one of whom was taken into the care of Protestant missionary Alphonse Rouel. This child, Wenceslas Thi, would become the father of Jean-Marie Tjibaou (1936–1989). In June 1940, after the fall of France, the Conseil General of New Caledonia voted unanimously to support the Free French government, and in September the pro-Vichy governor was forced to leave for Indochina. In March 1942, with the assistance of Australia, the territory became an important Allied base, and the main South Pacific Fleet base of the United States Navy in the South Pacific moved to Noumea in 1942–1943. The fleet that turned back the Japanese navy in the Battle of the Coral Sea in May 1942 was based at Nouméa. American troops stationed on New Caledonia numbered as many as 50,000, the equivalent of the contemporary population. In 1946, New Caledonia became an overseas territory. By 1953, French citizenship had been granted to all New Caledonians, regardless of ethnicity. Between 1976 and 1988, conflicts between French government actions and the Kanak independence movement saw periods of serious violence and disorder. In 1983, a statute of "enlarged autonomy" for the territory proposed a five-year transition period and a referendum in 1989. In March 1984, the Kanak resistance, Front Indépendantiste, seized farms and the Kanak and Socialist National Liberation Front (FLNKS) formed a provisional government. In January 1985, the French Socialist government offered sovereignty to the Kanaks and legal protection for European settlers. The plan faltered as violence escalated. The government declared a state of emergency; however, regional elections went ahead, and the FLNKS won control of three out of four provinces. The centre-right government elected in France in March 1986 began eroding the arrangements established under the Socialists, redistributing lands mostly without consideration of native land claims, resulting in over two-thirds going to Europeans and less than a third to the Kanaks. By the end of 1987, roadblocks, gun battles and the destruction of property culminated in the Ouvéa cave hostage taking, a dramatic hostage crisis on the eve of the presidential elections in France. Pro-independence militants on Ouvéa killed four gendarmes and took 27 hostage. The military response resulted in nineteen Kanak deaths and another three deaths in custody. The Matignon Agreements, signed on 26 June 1988, ensured a decade of stability. The Nouméa Accord signed 5 May 1998, set the groundwork for a 20-year transition that gradually transfers competences to the local government. Following the timeline set by the Nouméa Accord that stated a vote must take place by the end of 2018, the groundwork was laid for a referendum on full independence from France at a meeting chaired by the French Prime Minister Édouard Philippe on 2 November 2017, to be held by November 2018. Voter list eligibility had been a subject of a long dispute, but the details have since been resolved. On 20 March 2018, the government announced a referendum that was held on 4 November 2018, with independence being rejected. New Caledonia is a territory sui generis to which France has gradually transferred certain powers. As such its citizens have French nationality and vote for the president of France. They have the right to vote in elections to the European Parliament. It is governed by a 54-member Territorial Congress, a legislative body composed of members of three provincial assemblies. The French State is represented in the territory by a High Commissioner. At a national level, New Caledonia is represented in the French Parliament by two deputies and two senators. At the 2012 French presidential election, the voter turnout in New Caledonia was 61.19%. For 25 years, the party system in New Caledonia was dominated by the anti-independence The Rally–UMP. This dominance ended with the emergence of a new party, Avenir Ensemble, also opposed to independence, but considered more open to dialogue with the Kanak movement, which is part of the Kanak and Socialist National Liberation Front, a coalition of several pro-independence groups. Kanak people have recourse to customary authorities regarding civil matters such as marriage, adoption, inheritance, and some land issues. The French administration typically respects decisions made in the customary system. However, their jurisdiction is sharply limited in penal matters, as some matters relating to the customary justice system, including the use of corporal punishment, are seen as clashing with the human rights obligations of France. The Armed Forces of New Caledonia (French: Forces armées de Nouvelle-Calédonie) FANC, include about 2,000 soldiers, mainly deployed in Koumac, Nandaï, Tontouta, Plum, and Nouméa. The land forces consist of a regiment of the Troupes de marine, the Régiment d'infanterie de marine du Pacifique. The naval forces include two P400-class patrol vessels, a BATRAL, and a patrol boat of the Maritime Gendarmerie. The air force is made up of three Casa transport aircraft, four Puma helicopters and a Fennec helicopter, based in Tontouta. In addition, 760 gendarmes are deployed on the archipelago. New Caledonia has been a member of the Pacific Community since 1983 with Noumea the home of the organizations regional headquarters. Since 1986, the United Nations Committee on Decolonization has included New Caledonia on the United Nations list of Non-Self-Governing Territories. An independence referendum was held the following year, but independence was rejected by a large majority. Under the Nouméa Accord, signed in 1998 following a period of secessionist unrest in the 1980s and approved in a referendum, New Caledonia held a second referendum on independence on 4 November 2018, where 56.9% of voters chose to remain with France. The official name of the territory, Nouvelle-Calédonie, could be changed in the near future due to the accord, which states that "a name, a flag, an anthem, a motto, and the design of banknotes will have to be sought by all parties together, to express the Kanak identity and the future shared by all parties." To date, however, there has been no consensus on a new name for the territory, although Kanak Republic is popular among 40% of the population. New Caledonia has increasingly adopted its own symbols, choosing an anthem, a motto, and a new design for its banknotes. In July 2010, New Caledonia adopted the Kanak flag, alongside the existing French tricolor, as dual official flags of the territory. The adoption made New Caledonia one of the few countries or territories in the world with two official national flags. The decision to use two flags has been a constant battleground between the two sides and led the coalition government to collapse in February 2011. South Province (province Sud). Provincial capital: Nouméa. Area 9,407 km2. Population: 183,007 inhabitants (2009). North Province (province Nord). Provincial capital: Koné. Area: 7,348 km2. Population: 45,137 inhabitants (2009). Loyalty Islands Province (province des îles Loyauté). Provincial capital: Lifou. Area: 1,981 km2. Population: 17,436 inhabitants (2009). The mainland is divided in length by a central mountain range whose highest peaks are Mont Panié (1,629 metres (5,344 ft)) in the north and Mont Humboldt (1,618 m (5,308 ft)) in the southeast. The east coast is covered by a lush vegetation. The west coast, with its large savannahs and plains suitable for farming, is a drier area. Many ore-rich massifs are found along this coast. The Diahot River is the longest river of New Caledonia, flowing for some 100 kilometres (62 mi). It has a catchment area of 620 km2 (240 sq mi) and opens north-westward into the Baie d'Harcourt, flowing towards the northern point of the island along the western escarpment of the Mount Panié. Most of the island is covered by wet evergreen forests, while savannahs dominate the lower elevations. The New Caledonian lagoon, with a total area of 24,000 square kilometres (9,300 sq mi) is one of the largest lagoons in the world. It is surrounded by the New Caledonia Barrier Reef. The climate is tropical, with a hot and humid season from November to March with temperatures between 27 °C and 30 °C, and a cooler, dry season from June to August with temperatures between 20 °C and 23 °C, linked by two short interstices. The tropical climate is strongly moderated by the oceanic influence and the trade winds that attenuate humidity, which can be close to 80%. The average annual temperature is 23 °C, with historical extremes of 2.3 °C and 39.1 °C. The rainfall records show that precipitation differs greatly within the island. The 3,000 millimetres (120 in) of rainfall recorded in Galarino are three times the average of the west coast. There are also dry periods, because of the effects of El Niño. Between December and April, tropical depressions and cyclones can cause winds to exceed a speed of 100 kilometres per hour (62 mph), with gusts of 250 kilometres per hour (160 mph) and very abundant rainfall. The last cyclone affecting New Caledonia was Cyclone Cook, in January 2017. Bruno Van Peteghem was in 2001 awarded the Goldman Environmental Prize for his efforts on behalf of the Caledonian ecological protection movement in the face of "serious challenges" from Jacques Lafleur's RPCR party. Progress has been made in a few areas in addressing the protection of New Caledonia's ecological diversity from fire, industrial and residential development, unrestricted agricultural activity and mining (such as the judicial revocation of INCO's mining license in June 2006 owing to claimed abuses). More of tropical gymnosperm species are endemic to New Caledonia than to any similar region on Earth. Of the 44 indigenous species of gymnosperms, 43 are endemic, including the only known parasitic gymnosperm (Parasitaxus usta). Also, of the 35 known species of Araucaria, 13 are endemic to New Caledonia. New Caledonia also has the world's most divergent lineage of flowering plant, Amborella trichopoda, which is at, or near, the base of the clade of all flowering plants. New Caledonia is home to the New Caledonian crow, a bird noted for its tool-making abilities, which rival those of primates. These crows are renowned for their extraordinary intelligence and ability to fashion tools to solve problems, and make the most complex tools of any animal yet studied apart from humans. There are 11 endemic fish species and 14 endemic species of decapod crustaceans in the rivers and lakes of New Caledonia. Some, such as Neogalaxias, exist only in small areas. The nautilus—considered a living fossil and related to the ammonites, which became extinct at the end of the Mesozoic era—occurs in Pacific waters around New Caledonia. There is a large diversity of marine fish in the surrounding waters, which are within the extents of the Coral Sea. Several species of New Caledonia are remarkable for their size: Ducula goliath is the largest extant species of pigeon; Rhacodactylus leachianus, the largest gecko in the world; Phoboscincus bocourti the largest skink in the world, thought to be extinct but rediscovered in 2003. At the last census in 2014, New Caledonia had a population of 268,767. Of these, 17,436 live in the Loyalty Islands Province, 45,137 in the North Province, and 183,007 in the South Province. Population growth has slowed down since the 1990s, but remains strong with a yearly increase of 1.7% between 1996 and 2009. Over 40% of the population is under 20, although the ratio of older people on the total population is increasing. Two residents of New Caledonia out of three live in Greater Nouméa. Three out of four were born in New Caledonia. The total fertility rate went from 3.2 children per woman in 1990 to 2.2 in 2007. The other self-reported communities were Wallisians and Futunians (8.2% of the total population, down from 8.7% at the 2009 census), Indonesians (3.4% of the total population, up from 1.6% at the 2009 census), Tahitians (2.1% of the total population, up from 2.0% at the 2009 census), Ni-Vanuatu (1.0%, up from 0.9% at the 2009 census), Vietnamese (0.9%, down from 1.0% at the 2009 census), and other Asians (primarily ethnic Chinese; 0.4% of the total population, down from 0.8% at the 2009 census). Finally 8.6% of the population reported belonging to multiple communities (mixed race) (up from 8.3% at the 2009 census), and 2.5% refused to report any community (up from 1.2% at the 2009 census). The question on community belonging, which had been left out of the 2004 census, was reintroduced in 2009 under a new formulation, different from the 1996 census, allowing multiple choices (mixed race) and the possibility to clarify the choice "other". The Kanak people, part of the Melanesian group, are indigenous to New Caledonia. Their social organization is traditionally based around clans, which identify as either "land" or "sea" clans, depending on their original location and the occupation of their ancestors. According to the 2009 census, the Kanak constitute 94% of the population in the Loyalty Islands Province, 74% in the North Province and 27% in the South Province. The Kanak tend to be of lower socio-economic status than the Europeans and other settlers. Distinct from the Caldoches are those were born in New Caledonia from families that had settled more recently, and are called simply Caledonians. The Metropolitan French-born migrants who come to New Caledonia are called Métros or Zoreilles, indicating their origins in metropolitan France. There is also a community of about 2,000 pieds noirs, descended from European settlers in France's former North African colonies; some of them are prominent in anti-independence politics, including Pierre Maresca, a leader of the RPCR. A 2015 documentary by Al Jazeera English asserted that up to 10%[dubious – discuss] of New Caledonia's population is descended from around 2,000 Arab-Berber people deported from French Algeria in the late 19th century to prisons on the island in reprisal for the Mokrani Revolt in 1871. After serving their sentences, they were released and given land to own and cultivate as part of colonisation efforts on the island. As the overwhelming majority of the Algerians imprisoned on New Caledonia were men, the community was continued through intermarriage with women of other ethnic groups, mainly French women from nearby women's prisons. Despite facing both assimilation into the Euro-French population and discrimination for their ethnic background, descendants of the deportees have succeeded in preserving a common identity as Algerians, including maintaining certain cultural practices (such as Arabic names) and in some cases Islamic religion. Some travel to Algeria as a rite of passage, though obtaining Algerian citizenship is often a difficult process. The largest population of Algerian-Caledonians lives in the commune of Bourail (particularly in the Nessadiou district, where there is an Islamic cultural centre and cemetery), with smaller communities in Nouméa, Conné, Blambut, and Surianté. The French language began to spread with the establishment of French settlements, and French is now spoken even in the most secluded villages. The level of fluency, however, varies significantly across the population as a whole, primarily due to the absence of universal access to public education before 1953, but also due to immigration and ethnic diversity. At the 2009 census, 97.3% of people aged 15 or older reported that they could speak, read and write French, whereas only 1.1% reported that they had no knowledge of French. Other significant language communities among immigrant populations are those of Wallisian and Javanese language speakers. The 28 Kanak languages spoken in New Caledonia are part of the Oceanic group of the Austronesian family. Kanak languages are taught from kindergarten (four languages are taught up to the bachelor's degree) and an academy is responsible for their promotion. The three most widely spoken indigenous languages are Drehu (spoken in Lifou), Nengone (spoken on Maré) and Paicî (northern part of Grande Terre). Others include Iaai (spoken on Ouvéa). At the 2009 census, 35.8% of people aged 15 or older reported that they could speak (but not necessarily read or write) one of the indigenous Melanesian languages, whereas 58.7% reported that they had no knowledge of any of them. New Caledonia's main tertiary education institution is the University of New Caledonia (Université de la Nouvelle-Calédonie), which was founded in 1993 and comes under the supervision of the Ministry of Higher Education, Research and Innovation. It is based in Nouméa and offers a range of vocational, Bachelor, MA, and PhD programmes and courses. The University of New Caledonia consists of three academic departments, one institute of technology, one PhD school, and one teacher's college. As of 2013, the University has approximately 3,000 students, 107 academics, and 95 administrative and library staff. Many New Caledonian students also pursue scholarships to study in metropolitan France. As part of the Nouméa Accord process, a Cadre Avenir provides scholarships for Kanak professionals to study in France. New Caledonia has one of the largest economies in the South Pacific, with a GDP of US$9.89 billion in 2011. The nominal GDP per capita was US$38,921 (at market exchange rates) in 2011. It is higher than New Zealand's, though there is significant inequality in income distribution, and long-standing structural imbalances between the economically dominant South Province and the less developed North Province and Loyalty Islands. The currency in use in New Caledonia is the CFP franc, pegged to the euro at a rate of 1,000 CFP to 8.38 euros. It is issued by the Institut d'Emission d'Outre-Mer. Real GDP grew by 3.8% in 2010 and 3.2% in 2011, boosted by rising worldwide nickel prices and an increase in domestic demand due to rising employment, as well as strong business investments. In 2011, exports of goods and services from New Caledonia amounted to 2.11 billion US dollars, 75.6% of which were mineral products and alloys (mainly nickel ore and ferronickel). Imports of goods and services amounted to 5.22 billion US dollars. 22.1% of the imports of goods came from Metropolitan France and its overseas departments, 16.1% from other countries in the European Union, 14.6% from Singapore (essentially fuel), 9.6% from Australia, 4.5% from the United States, 4.2% from New Zealand, 2.0% from Japan, and 27.0% from other countries. The trade deficit in goods and services stood at 3.11 billion US dollars in 2011. Financial support from France is substantial, representing more than 15% of the GDP, and contributes to the health of the economy. Tourism is underdeveloped, with 100,000 visitors a year, compared to 400,000 in the Cook Islands and 200,000 in Vanuatu. Much of the land is unsuitable for agriculture, and food accounts for about 20% of imports. According to FAOSTAT, New Caledonia is one of world's largest producers of: yams (33rd); taro (44th); plantains (50th); coconuts (52nd). The exclusive economic zone of New Caledonia covers 1.4 million square kilometres (0.54 million square miles). The construction sector accounts for roughly 12% of GDP, employing 9.9% of the salaried population in 2010. Manufacturing is largely confined to small-scale activities such as the transformation of foodstuffs, textiles and plastics. A creek in southern New Caledonia. Red colors reveal the richness of the ground in iron oxides and nickel. New Caledonian soils contain about 25% of the world's nickel resources. The late-2000s recession has gravely affected the nickel industry, as the sector faced a significant drop in nickel prices (−31.0% year-on-year in 2009) for the second consecutive year. The fall in prices has led a number of producers to reduce or stop altogether their activity, resulting in a reduction of the global supply of nickel by 6% compared to 2008. Wood carving, especially of the houp (Montrouziera cauliflora), is a contemporary reflection of the beliefs of the traditional tribal society, and includes totems, masks, chambranles, or flèche faîtière, a kind of arrow that adorns the roofs of Kanak houses. Basketry is a craft widely practiced by tribal women, creating objects of daily use. The Jean-Marie Tjibaou Cultural Centre, designed by Italian architect Renzo Piano and opened in 1998, is the icon of the Kanak culture. The Mwâ Ka is a 12m totem pole commemorating the French annexation of New Caledonia, and was inaugurated in 2005. Les Nouvelles Calédoniennes is the only daily newspaper in the archipelago. A monthly publication, Le Chien bleu, parodies the news from New Caledonia. There are five radio stations: the public service broadcaster RFO radio Nouvelle-Calédonie, Océane FM (the collectivity's newest station), the youth-oriented station NRJ, Radio Djiido (established by Jean-Marie Tjibaou), and Radio Rythmes Bleus. The last two stations are primarily targeted to the various Kanak groups who are indigenous to New Caledonia ("Djiido" is a term from the Fwâi language, spoken in Hienghène in the North Province, denoting a metal spike used to secure straw thatching to the roof of a traditional Kanak house). As for television, the public service broadcaster France Télévision operates a local channel, Réseau Outre-Mer 1re, along with France 2, France 3, France 4, France 5, France Ô, France 24 and Arte. Canal Plus Calédonie carries 17 digital channels in French, including Canal+ and TF1. Analogue television broadcasts ended in September 2011, completing the digital television transition in New Caledonia. Bids for two new local television stations, NCTV and NC9, were considered by the French broadcasting authorities. NCTV was launched in December 2013. The media are considered to be able to operate freely, but Reporters Without Borders raised concerns in 2006 about "threats and intimidation" of RFO staff by members of a pro-independence group. The largest sporting event to be held in New Caledonia is a round of the FIA Asia Pacific Rally Championship (APRC). The New Caledonia football team began playing in 1950, and was admitted into FIFA, the international association of football leagues, in 2004. Prior to joining FIFA, New Caledonia held observer status with the Oceania Football Confederation, and became an official member of the OFC with its FIFA membership. They have won the South Pacific Games five times, most recently in 2007, and have placed third on two occasions in the OFC Nations Cup. Christian Karembeu is a prominent New Caledonian former footballer. The under-17 team qualified for the FIFA under 17 World Cup in 2017. Horse racing is also very popular in New Caledonia, as are women's cricket matches. The rugby league team participated in the Pacific Cup in 2004. The "Tour Cycliste de Nouvelle-Calédonie" is a multi-day cycling stage race that is held usually in October. The race is organised by the Comite Cycliste New Caledonia. The race attracts riders from Australia, New Zealand, France, Reunion, Europe and Tahiti. Australian Brendan Washington has finished last three times in the race between 2005–2009, and is known in New Caledonia as "The Lanterne Rouge". The New Caledonia Handball team won the Oceania Handball Nations Cup in 2008 held in Wellington, New Zealand. They beat Australia in the final. La Tontouta International Airport is 50 km (31 mi) northwest of Nouméa, and connects New Caledonia with the airports of Paris, Tokyo, Sydney, Auckland, Brisbane, Melbourne, Osaka, Papeete, Fiji, Wallis, Port Vila, Seoul, and St. Denis. Most internal air services are operated by the International carrier Aircalin. Cruise ships dock at the Gare Maritime in Nouméa. The passenger-and-cargo boat Havannah sails to Port Vila, Malicolo and Santo in Vanuatu once a month. ^ a b "La Nouvelle-Calédonie se dote d'un hymne et d'une devise". Le Monde.fr (in French). 2010-08-18. Retrieved 2013-01-30. ^ a b c d e f g h i j "PIB Grands Agrégats". ISEE. Archived from the original on 7 September 2013. Retrieved 2013-08-01. ^ a b c d "Présentation". Nouvelle-caledonie.gouv.fr (in French). Archived from the original on 30 October 2012. Retrieved 2013-01-30. ^ a b "Présentation – L'Outre-Mer". Outre-mer.gouv.fr. Retrieved 2013-01-30. ^ David Stanley (1989). South Pacific Handbook. David Stanley. p. 549. ISBN 978-0-918373-29-8. ^ a b c "268 767 habitants en 2014". ISEE. Retrieved 2014-11-16. ^ a b "Histoire / La Nouvelle-Calédonie". Nouvelle-caledonie.gouv.fr (in French). 2012-11-20. Archived from the original on 30 October 2012. Retrieved 2013-01-30. ^ a b c d Leanne Logan; Geert Cole (2001). New Caledonia. Lonely Planet. p. 13. ISBN 978-1-86450-202-2. ^ a b c d e f g h i j k l m n "Rapport annuel 2010" (PDF). IEOM Nouvelle-Calédonie. Retrieved 2013-01-30. ^ Quanchi, Max; Robson, John (2005). Historical Dictionary of the Discovery and Exploration of the Pacific Islands. Scarecrow Press. ISBN 9780810865280. ^ a b "New Caledonia and International Seaport History. The Maritime Heritage Project". Maritimeheritage.org. Retrieved 2017-11-12. ^ Frédéric Angleviel. "De Kanaka à Kanak: l'appropriation d'un terme générique au profit de la revendication identitaire" (PDF). Université de la Nouvelle-Calédonie. Retrieved 2013-01-30. ^ "Charting the Pacific – Places". Abc.net.au. 1998-10-13. Retrieved 2013-01-30. ^ a b Leanne Logan; Geert Cole (2001). New Caledonia. Lonely Planet. p. 15. ISBN 978-1-86450-202-2. ^ Bruce M. Knauft (1999). From Primitive to Postcolonial in Melanesia and Anthropology. University of Michigan Press. p. 103. ISBN 978-0-472-06687-2. ^ a b c d Robert Aldrich; John Connell (2006). France's Overseas Frontier: Départements et territoires d'outre-mer. Cambridge University Press. p. 46. ISBN 978-0-521-03036-6. ^ a b c d e f David Stanley (1989). South Pacific Handbook. David Stanley. pp. 549–. ISBN 978-0-918373-29-8. ^ "Hasluck: Clearing A Way To Total War" (PDF). Retrieved 6 August 2009. ^ Gordon L. Rottman (2002). World War 2 Pacific Island Guide. Greenwood Publishing Group. p. 71. ISBN 978-0-313-31395-0. In October, the decision was made to relocate the main South Pacific Fleet base from Auckland to Nouméa (FPO SF 131). Unloading facilities were improved by February 1943 and construction immediately began on the naval operating base. ^ "Land and Independence in New Caledonia". Retrieved 2017-11-12. ^ Roger, Patrick (2017-11-03). "Nouvelle-Calédonie : ce que contient l'" accord politique " sur le référendum d'autodétermination". Le Monde.fr. Retrieved 17 July 2018. ^ "New Caledonia sets date for independence referendum". The Guardian. 20 March 2018. Retrieved 25 March 2018. ^ "New Caledonia Votes to Remain Part of France". Time. Retrieved 2018-11-08. ^ a b c "Présentation – L'Outre-Mer". Outre-mer.gouv.fr. Retrieved 2013-01-30. ^ a b c d e f "Concluding session, Special Committee on Decolonization approves two texts on New Caledonia, Tokelau; hears appeals to heed criticism of its work". Un.org. Retrieved 2013-01-30. ^ "Les différentes élections". Nouvelle-caledonie.gouv.fr (in French). 2011-05-27. Archived from the original on 2011-11-11. Retrieved 2013-01-30. ^ Minister of the Interior, Government of France. "Resultats de l'election presidentielle – Nouvelle Caledonie" (in French). Retrieved 2012-08-06. ^ a b c d e "Sénat coutumier". Nouvelle-caledonie.gouv.fr (in French). Archived from the original on 30 October 2012. Retrieved 2013-01-30. ^ a b c d "Les Forces armées de Nouvelle-Calédonie". Defense.gouv.fr (in French). 2012-12-20. Retrieved 2013-01-30. ^ Willsher, Kim (19 March 2018). "New Caledonia sets date for independence referendum". The Guardian. Retrieved 20 March 2018. ^ "Paris meeting to prepare New Caledonia independence vote". Radio New Zealand. 2016-02-02. Retrieved 2016-03-08. ^ Reuters (2018-11-04). "New Caledonia votes 'non' to independence from France". the Guardian. Retrieved 2018-11-04. ^ Government of New Caledonia. "Les accords de Nouméa" (PDF) (in French). Archived from the original (PDF) on 5 April 2008. Retrieved 11 August 2008. ^ RFO. "Société : La Nouvelle-Calédonie choisit un hymne et une devise". Archived from the original on 27 June 2008. Retrieved 11 August 2008. ^ a b Bolis, Angela (2011-08-26). "Nouvelle-Calédonie: où en est le processus d'indépendance?". Le Monde.fr (in French). Retrieved 2013-01-30. ^ "Sarkozy calls for dialogue over New Caledonia violence". France 24. 2011-08-26. Retrieved 2013-01-30. ^ a b c d e f g "Données Géographiques". Nouvelle-caledonie.gouv.fr (in French). Archived from the original on 30 October 2012. Retrieved 2013-01-30. ^ "The impacts of opencast mining in New Caledonia". The United Nations University. Archived from the original on 27 July 2011. Retrieved 9 June 2011. ^ a b Grandcolas, P; Murienne, J; Robillard, T; Desutter-Grandcolas, L; Jourdan, H; Guilbert, E; Deharveng, L (2008). "New Caledonia: a very old Darwinian island?". Philosophical Transactions of the Royal Society B: Biological Sciences. 363 (1508): 3309–3317. doi:10.1098/rstb.2008.0122. PMC 2607381. PMID 18765357. ^ a b c d Leanne Logan; Geert Cole (2001). New Caledonia. Lonely Planet. p. 26. ISBN 978-1-86450-202-2. ^ a b c "La flore de Nouvelle-Calédonie – Première partie". Futura-sciences.com. 2004-08-18. Retrieved 2013-01-30. ^ "La flore de Nouvelle-Calédonie – Deuxième partie". Futura-sciences.com. 2004-08-18. Retrieved 2013-01-30. ^ Walker, Matt (2010-10-26). "Clever New Caledonian crows go to parents' tool school". BBC News. Retrieved 2013-01-30. ^ a b c "La Biodiversité". Endemia.nc. Archived from the original on 6 January 2013. Retrieved 30 January 2013. ^ "Population des communes et provinces de la Nouvelle-Calédonie de 1956 à 2009". ISEE. Archived from the original on 30 October 2012. Retrieved 2013-01-30. ^ a b c d e f g "Recensement de la population en Nouvelle-Calédonie en 2009 – 50 000 habitants de plus en 13 ans" (in French). Institut national de la statistique et des études économiques (INSEE.fr). Retrieved 2013-01-30. ^ ISEE. "Prov2 – Principales caractéristiques des individus, par province de résidence et genre" (XLS). Retrieved 2015-08-24. ^ a b c Leanne Logan; Geert Cole (2001). New Caledonia. Lonely Planet. p. 39. ISBN 978-1-86450-202-2. ^ "Recensement de la population 2009" (PDF). ISEE.nc. Retrieved 2013-01-30. ^ David A. Chappell (2005). "New Caledonia". The Contemporary Pacific. 17 (2): 435–448. doi:10.1353/cp.2005.0043. ^ Henry Kamm (26 July 1988). "Noumea Journal; On an Island in the Pacific, but Far From at Peace". New York Times. ^ "Situation linguistique en Nouvelle-Calédonie". Vice-Rectorat de Nouvelle-Calédonie. Retrieved 2013-01-30. ^ a b Principales caractéristiques des individus de 15 ans et plus, par province de résidence et sexe Archived 30 October 2012 at the Wayback Machine. isee.nc. Retrieved on 2013-02-28. ^ a b "La Population De Nouvelle-Caledonie" (in French). La maison de la Nouvelle-Calédonie. Archived from the original on 2009-04-26. Retrieved 2013-01-30. ^ a b c "Emerging Pacific Leaders Dialogue 2010 New Caledonia Report" (PDF). Commonwealth Study Conferences Australia. Retrieved 1 March 2018. ^ "What is education like in New Caledonia?". New Caledonia Today. 2013-02-28. Retrieved 1 March 2018. ^ "Presentation UNC en Anglais 2012" (PDF). University of New Caledonia. Retrieved 1 March 2018. ^ a b "World Economic Outlook Database – April 2013". IMF. Retrieved 2013-08-01. ^ a b "GDP by State". BEA, U.S. Department of Commerce. Retrieved 2013-08-01. ^ a b c "New Caledonia – Information Paper". NZ Ministry of Foreign Affairs and Trade. Archived from the original on 28 January 2013. Retrieved 2013-01-30. ^ "Vie pratique – L'Outre-Mer". Outre-mer.gouv.fr. Retrieved 2013-01-30. ^ ISEE.nc. "Commerce extérieur – Séries longues" (in French). Archived from the original (XLS) on 4 November 2013. Retrieved 2013-08-01. ^ a b "New Caledonia". The World Factbook. Central Intelligence Agency. ^ "FAOSTAT 2008 by Production". Faostat.fao.org. Retrieved 6 June 2008. ^ a b c d e f "Les comptes économiques rapides de Nouvelle-Calédonie" (PDF). ISEE.nc. Retrieved 2013-01-30. ^ a b c d "La Culture". Tourisme Nouvelle-Calédonie. Archived from the original on 2011-07-24. Retrieved 2013-01-30. ^ "Mwâ Ka in Noumea, New Caledonia". Lonely Planet. Retrieved 2013-01-30. ^ a b "Vivre en Nouvelle-Calédonie". Gîtes Nouvelle Calédonie. Retrieved 2013-01-30. ^ "Le Chien bleu : Journal satirique de Nouvelle-Calédonie. Y en aura pour tout le monde !". Lechienbleu.nc. Retrieved 17 July 2018. ^ "Télévision Numérique Terrestre (TNT)". Gouv.nc. 2016-01-31. Retrieved 17 July 2018. ^ "Grille TV – Canal+ Calédonie". Canalplus-caledonie.com. Retrieved 17 July 2018. ^ L'Outre-mer dit adieu à l'analogique – Audiovisuel – Info – Nouvelle-Calédonie – La 1ère. nouvellecaledonie.la1ere.fr. ^ on 12 October 2011 UTC (2011-10-12). "Two new New Caledonia television channels proposed". Rnzi.com. Retrieved 2013-01-30. ^ "Regions and territories: New Caledonia". BBC News. 2013-01-16. Retrieved 2013-01-30. ^ Swaminathan, Swaroop (12 October 2018). "Karembeu, France & New Caledonia – a complex relationship". New Indian Express. Retrieved 4 November 2018. ^ "New Caledonia joins the world football community". FIFA.com. 24 May 2004. Archived from the original on 2007-07-18. Retrieved 6 August 2009. ^ "Women's Cricket". Lonely Planet. Retrieved 2013-01-30. ^ "What Do People Eat in New Caledonia?". Newcaledoniatoday.wordpress.com. 2013-01-30. Retrieved 16 February 2014. ^ a b "Transport in New Caledonia". Lonely Planet. Retrieved 2013-01-30. ^ "Site de la DITTT – Infrastructures routières". Dittt.gouv.nc. Archived from the original on 8 September 2015. Retrieved 17 July 2018. Look up New Caledonia, Lapita, Kanak, Kanaka, or blackbirding in Wiktionary, the free dictionary.